CHRISTINE POULSON » The books that people leave in hotels . . . The books that people leave in hotels . . . I had plenty of books on my e-reader (and a little World’s Classics edition of Persuasion, just in case), but what I actually read during my first week in China was a book that I found at the splendid Red Wall Garden Hotel in Beijing. I like the custom that’s grown up of people leaving their holiday reading behind. You can come across some good things that way. Years ago I discovered a copy of Michael Connolly’s The Concrete Blonde in a hotel in Greece and he became one of my favourite crime-writers. It is always fascinating to see what other people have been reading. A day or two into our holiday we were having lunch in a hotel in one of the hutongs, the old residential quarters of Beijing, and I spotted a veritable library of discarded paperbacks. The books were divided into escapist crime fiction and solid classics, pretty representative of my own holiday reading. Agatha Christie’s N or M ? rubbed shoulders with Kakfa’s The Trial, A is for Alibi with Portrait of a Lady and The Great Gatsby. I was pleased to see a copy of The False Inspector Dew by my friend, Peter Lovesey. The book I found in the Red Wall Garden Hotel was Paul French’s Midnight in Peking: The Murder That Haunted the Last Days of Old China, highly appropriate reading, and I’ll be saying more about it in another post. 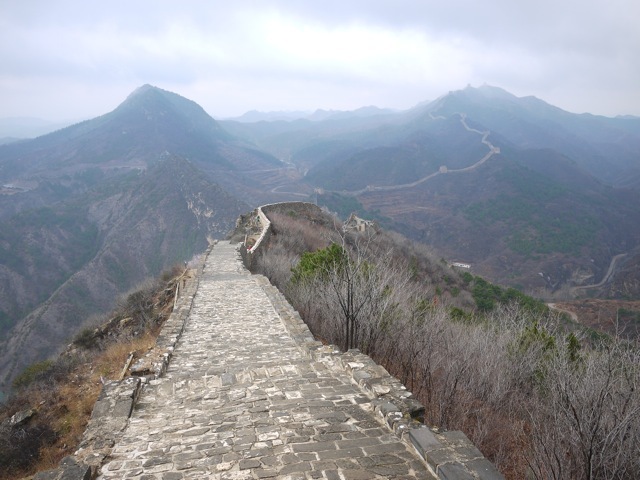 And as for the actual holiday, less than a fortnight ago I was actually standing on the spot on the Great Wall from which my husband took this photograph. China! Lucky you, what a fabulous experience. Look forward to hearing more about the trip and the books you found there…. Thanks, Moira. Yes, it was amazing. Yes, more to come on the blog. Great photo, must have been a fab trip. Agatha gets everywhere. I found a German language version of The Man in the Brown Suit in a hotel in the Atacama Desert last month! Yes, there was so much that was wonderful, not least the terracotta army – more about that another time. I wonder if Agatha has been translated into Chinese. I must check!